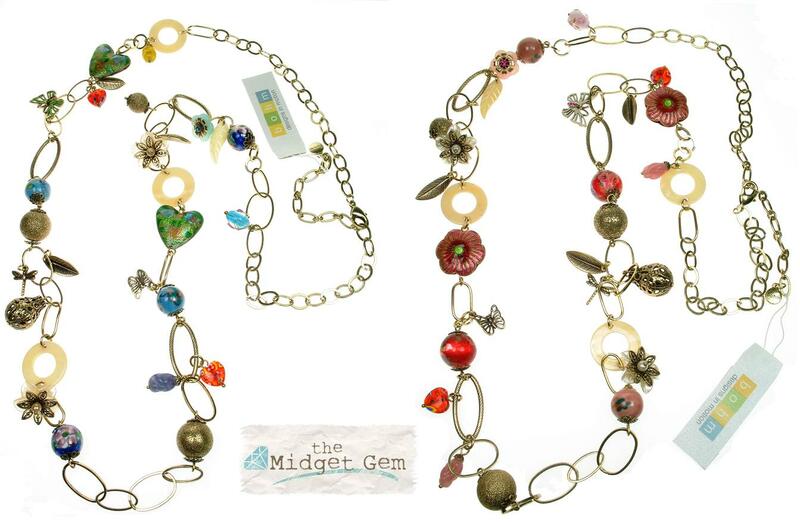 This series mixes a stunning array of vintage inspired beads and charms to achieve this very Bohemian hand crafted range. 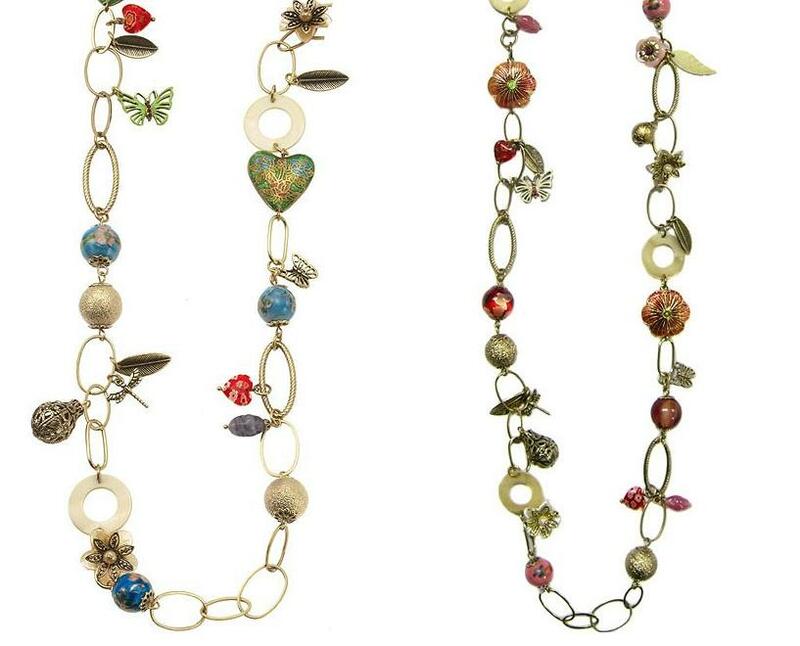 Among the many beads you will find: cloisonné; millefiori and lampwork glass beads; Swarovski crystals; various wood and porcelain beads; burnished gold leaves and dragonfly charms; filigree balls; mother of pearl leaves; enamelled butterflies and flower charms. Available in blue/green or pink colourways. Adjustable longer length necklace with a variety of different style links. Adorned with pretty charms and beads. Smallest bead 1cm/10mm largest bead 2cm/20mm. Adjustable length 92 cm/36 inches to 100cm/39 inches. Vintage gold plate. Adjustable charm bracelet. Smallest bead 1cm/10mm largest bead 2cm/20mm. Adjustable length 19cm/7.5 inches to 23cm/9 inches. Link size 1.5cm/15mm x 1cm/10mm. Stretch style charm bracelet. The bracelet gently stretches to fit the wrist comfortably. Unstretched it measures 18cm/7 inches. Smallest bead 1cm/10mm largest bead 2cm/20mm. Link size 1.5cm/15mm x 1cm/10mm. Pretty vintage style 'Y' drop design, adjustable length necklace. Smallest bead 1cm largest bead 2cm. Length of the front drop is 9cm / 3.5 inches. Adjustable length 39cm/15.5 inches to 47cm/18.5 inches. Vintage gold plate. Flower drop earrings. French clip for pierced ears. 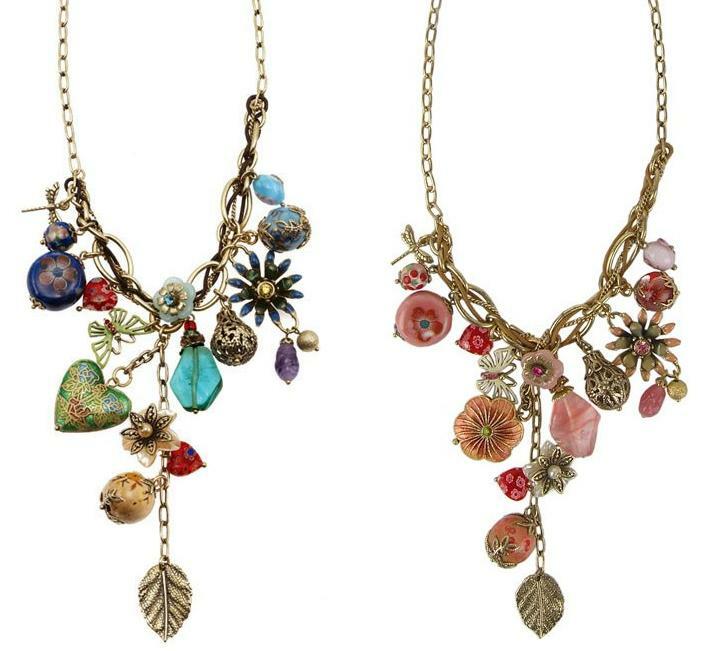 Pretty vintage style with pressed glass floral beads, Swarovski crystal, lampwork glass beads, burnished textured gold plated beads and lengths of chain with triangular drops. Smallest bead 5mm largest bead 1.2cm/12mm. Total length 7cm/70mm. Cloisonné enamel motif earrings. French clip for pierced ears. These pretty vintage inspired earrings feature floral/heart shaped cloisonné beads (2cm/20mm). Total length 4.3cm/43mm. Pretty floral porcelain bead earrings. French clip for pierced ears. Vintage inspired design earrings with burnished gold plate ornate caps and dangly dragonfly charms. The beads measure 1.3cm/12mm. Total length 5cm/50mm. 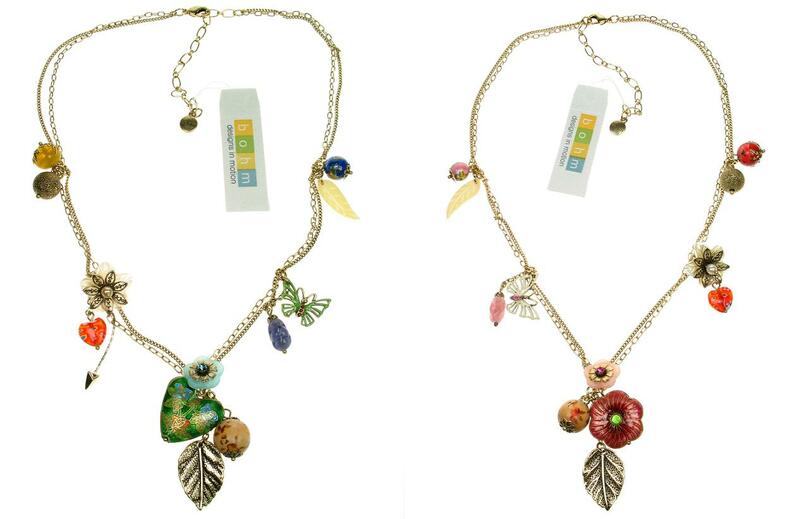 Pretty adjustable charm necklace. Vintage inspired design. Smallest bead 1cm/10mm largest bead 2.3cm/23mm. Length of front drop 5cm/50mm. Adjustable length 45cm/17.5 inches to 53cm/21inches. Adjustable tassel charm necklace. Pretty vintage inspired necklace. Smallest bead 1cm/10mm largest bead 2.3cm/23mm. Length of front drop 7cm/70mm. Adjustable length 41cm/16 inches up to 48cm/19 inches. Adjustable longer length elaborate tassel charm necklace. Pretty vintage inspired design. Smallest bead 1cm/10mm largest bead 2.3cm/23mm. Length of tassel 11.5cm/4.5 inches. Adjustable length 70cm/27.5 inches up to 78cm/30.5 inches.